KIEV, Ukraine -- As a resurgence in fighting swept eastern Ukraine, 18-year-old Tanya Sukharevskaya signed on to Vkontakte, the Russian variant of Facebook . 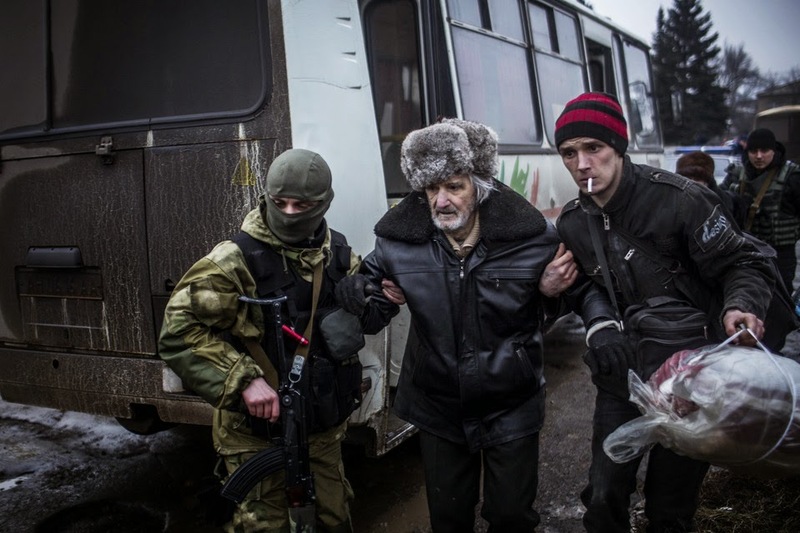 An elderly man is helped by a Ukrainian army soldier and another man during an evacuation of civilians in Debaltseve, in the eastern Donetsk region, on Tuesday. It had been six days since she heard from her mother, who had moved 60 miles away from their hometown to the city of Debaltseve for work three months ago. Artillery fire had been killing civilians there again. She tried to call but couldn’t get through. “I am managing to calm myself down, but my grandma (her mother) and my younger brother (her 6-year-old son) are crying every day,” Ms. Sukharevskaya wrote in a Vkontakte forum called “Overheard in Debaltsevo,” using the Russian spelling common in the region. She posted a photo of herself alongside her mother—smiling with a bouquet of roses and a cake—and included all she knew about her recent whereabouts. “I just want to know that everything is OK,” she wrote. In the midst of the latest violence, online social-networking groups dedicated to specific towns in eastern Ukraine are offering some of the most vivid, real-time glimpses into the conflict’s crushing impact on civilians. Groups originally created as forums for gossip or casual jokes have been transformed into clearing houses for information, sympathy, political outbursts, opprobrium and support. Each is a constantly changing tapestry of a town’s woes, woven in personal comments that show the surreal nature of a retrograde artillery war in the social-media age. “Overheard in Svetlodarsk” began last spring “out of humor, but gradually we moved from people’s secrets to the topic of war,” Marina Tsarevna, the administrator of the group, said in an online interview. The town, known as Svitlodarsk in Ukrainian, has been plunged into violence amid a new rebel push to seize nearby Debaltseve, a main transport hub. Cities on both side of the front have active social-media community groups. When attacks hit, residents often sign on to the groups to compare notes on where the shells are falling. They share accounts of the explosions that are keeping them up at night or pictures of the damage the next day. At times, they fight over whether it is appropriate to describe the location of outgoing fire—a possible tip-off to the enemy or an invitation for a retaliatory attack. Administrators periodically announce a “roll call,” and users respond in the comments with the addresses of buildings that have been hit by artillery shells. Phone numbers to arrange evacuation, advice on how to leave, pleas to check in on loved-ones and abandoned homes and questions about the conflict’s ever-growing bureaucracy of permits feature regularly as topics. Some users post poems calling for peace. The groups feel like a cross between crisis-care centers and raucous town-hall meetings, their level of aggression depending in part on the level of involvement by moderators. Those that are less closely regulated can descend into a netherworld of propaganda, name-calling and profanity. Many interactions are more wholesome. In some cases, where people have all but deserted a community of ruined homes and empty streets, its virtual equivalent has continued to bustle with life. Displaced residents interact with one another from places of refuge. Some pledge to return and rebuild. Maria Maksimova, 25, a civil engineer who helps administer a group dedicated to the city of Popasna, or Popasnaya in Russian, says the conflict has divided people “on either side of the barricades” along political lines, but also united them in trauma. “Many really no longer care who’s at the helm (of the country). They just want everyone to stop shooting, terrifying children and destroying homes,” Ms. Maksimova said in an online interview. Known as “Typical Popasnaya,” the group received 65,015 unique visitors in the past 30 days, more than three times the city’s population before the conflict. Traffic to the site generally rises alongside the violence, and the volunteer administrators scramble to approve all the posts and ban users who swear or otherwise violate the rules of conduct. As fighting swept Popasna in recent days, the site’s page views surged to 84,354 from fewer than 10,000 during a peaceful stretch around Jan. 1. Ms. Maksimova fled the violence there last year and took up with relatives in Kharkiv. Many others have fled, leaving the online group with less on-the-ground information. The electricity goes in and out, as does cellphone service, often preventing those remaining in the city from sharing. When violence gets extreme in certain towns, on-the-scene posts trail off almost entirely. “Fewer and fewer eyewitnesses are offering information, unfortunately,” Ms. Maksimova said of her group. The posts are often heartbreaking. In “Typical Popasnaya” on Tuesday, a man begged someone to check in on his grandmother, whom he hadn’t heard from in weeks. Another user asked about a woman’s fate, only to have a commenter respond with a photo of the woman’s destroyed home. A third user, the son of her former coworker, informed the group that the woman had died inside. The Svitlodarsk group overflowed with people begging drivers to pick up their elderly parents, left behind after a patchy, last-minute evacuation of civilians by Ukrainian authorities. Between fierce political arguments, strangers offer one another help. Ms. Sukharevskaya received a message soon after submitting her post in search of her mother in Debaltseve. A woman whose husband had been working with her mother confirmed everything was all right. The following day, cellphone service returned, and her mother called. Ms. Sukharevskaya was relieved, but the panic hasn’t dissipated. In an online interview, she said her mother was still in Debaltseve. She had been robbed recently, leaving her without the necessary documents to pass through the conflict zone’s many checkpoints, Ms. Sukharevskaya said of her mother. She hoped her mother would find a way home.